As soon as winter arrives, you should start thinking about your outdoor space and what you can do to improve your garden for better next year. This is the time to think about getting rid of old furniture and flower pots that have seen better days and what new plants and flowers will look best in your garden. Your outdoor space is an extension of your home, which is why you need to make sure that it looks picture-perfect. With the right tips, you can improve your garden and make sure that it looks breathtaking next year. Now, the first thing to think about: how do your boundaries look? By looking out of your windows and considering what is out there, you can decide if your boundaries look good as they are or can be made to look more pleasing. If it is a boring old fence or wall, you can use imagination and give it a makeover with wood treatment or spraying it with some paint to give it a nice color. This is another good time to start thinking about garden borders. Did you really think they looked good this summer or did you keep them around for sentimental reasons? If you are not sure, it is best to start anew and freshen up the soil and get in some new bulbs too. Look around for ideas on how to plant a garden border. You can create a new look for your garden without spending a fortune by pruning and training your trees and shrubs. Keep in mind that these plants should be compatible, so that the look you create has coherence. You should consider the options you have for seasonal changes such as color, leaf textures and shape, blossoming flowers as well as fruits and berries and then create the new look. Every garden needs pots and containers and make sure that you always choose big ones for yours. Plants need a lot of space for roots as well as water and wind stability. There are many options when it comes to pots and containers; you can go for galvanized ones or coopered wooden ones that have steel banks. Italian terracotta also looks great. High-quality pots and containers are worth the money you spend as they can last years. There is nothing like picking food from your own garden and it is quite easy to make veggie or herb table beds. They are also manageable and easy to move when you need to. Remember to use netting to protect your table beds. You may also consider building an outdoor kitchen. A pizza oven is a great option as it can also be used as a fireplace when you are not cooking. Birds, butterflies, squirrels, bees and other wildlife are always a part of gardens and there are many things on the market that will encourage these creatures to come to your garden. However, remember that there is nothing like a great design and clever planting to encourage wildlife. Birds, butterflies, bees, and other creatures, not only pretty up a garden, but also eliminate pests and do other good stuff for it. The surfaces in a garden play a role in how it looks, so it is important to think about them. It may be easy to get cheap concrete paving but getting good surface is important as it can alter the quality completely. Decking is a poignant option and you can also go for patterned concrete tiles or encaustic ones. Gravel is another top option, especially if you have uneven ground and want to avoid large amounts of leveling. There are always parts of a garden that do not have a great view but you can create one by using a little imagination and creativity. Boundaries, as mentioned earlier, are connected to views. Do not try to block a bad view; it is a better idea to fade it out by using a few tricks. Consider a gauzy shrub like Genista aetnensis that can help soften and eliminate an ugly view or make a good one even more intense. A pergola or gazebo is a fantastic way to improve a garden and create a space where you can unwind after a long day. Such structures add beauty and purpose, so having one, even if it is not too big, is a great idea. 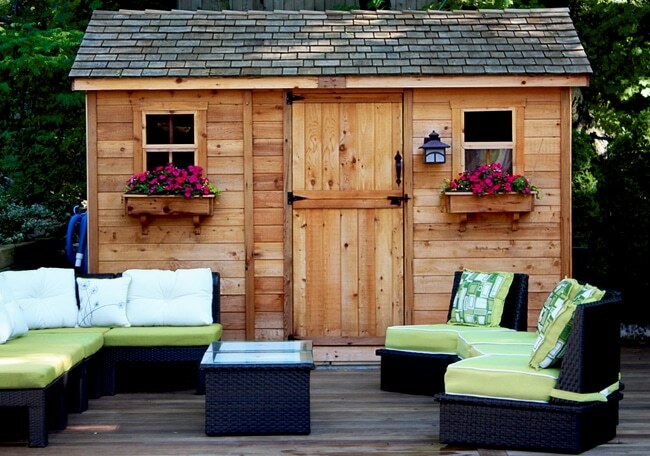 Garden sheds too add a little something extra to a garden and you can find one at a DIY store, ready to be dressed up as you like. Water is an essential in every garden and you need to make sure that you have it in your garden. A Japanese pond with stones of different sizes will look amazing. You can also make a little pool with an old washing-up bowl. Fountains add beauty while giving your garden the water, it always needs. It is important to make sure that your garden has water features, so think of a great way to get one that looks beautiful and works at the same time. It does not have to be a grueling task to improve your garden . A few simple ideas can help you obtain a wonderful garden that looks beautiful. With intelligent planning and a bit of creativity, you can have an outdoor space that you can be proud of.